I’ll be honest, I’m usually very skeptical about high-end Chinese restaurants. After many a mediocre and underwhelming meal, I continue to stick by my usual budget options in Chinatown and Bayswater that have been providing me with sustenance since my uni days. Hence, when I first heard about the opening of A.Wong in Victoria earlier this year, I pretty much dismissed it as soon as I saw its SW1 postcode. It took some insistence from Jo who went ahead and booked a table here for my mom’s birthday despite my initial reluctance for us to get round to trying it. And I’m glad she did because how wrong I was to write it off before giving it a chance. Chef proprietor Andrew Wong after whom the restaurant is named has travelled extensively throughout China to study the culinary secrets and idiosyncrasies of the various regional cuisines. An ex-LSE graduate, Andrew decided instead to follow in the footsteps of his restauranteur parents, learning his craft at the Westminster Kingsway College and at several of London’s top restaurants before launching A.Wong on the site of his family’s old restaurant business on Wilton Road. There’s a touch of finesse and the unconventional throughout here. 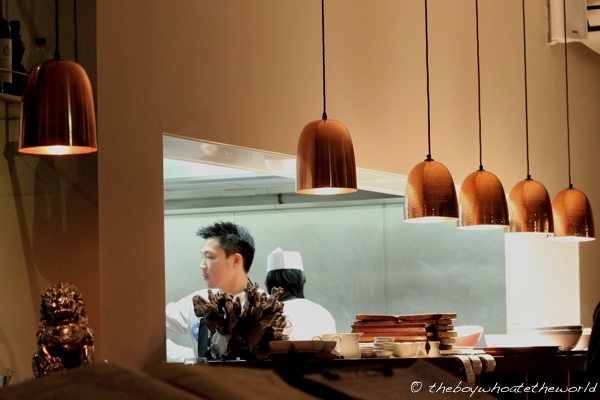 Take their refurbished open-plan kitchen for instance – much more Noma and Blumenthal-esque than something your would expect of a Chinese kitchen. Then there’s their innovative dishes… featuring everything from Yunnan truffles to Beijing street yoghurt to 65°C ‘tea’ infused eggs. 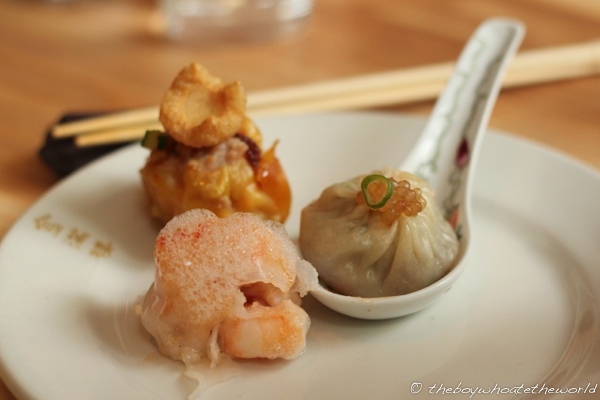 If you’re in for their A la Carte lunch, they even do Dim Sum by the individual piece here. Gone are the awkward moments of trying to split a Xiao Long Bao into two or the debate over who gets that last remaining Siu Mai. 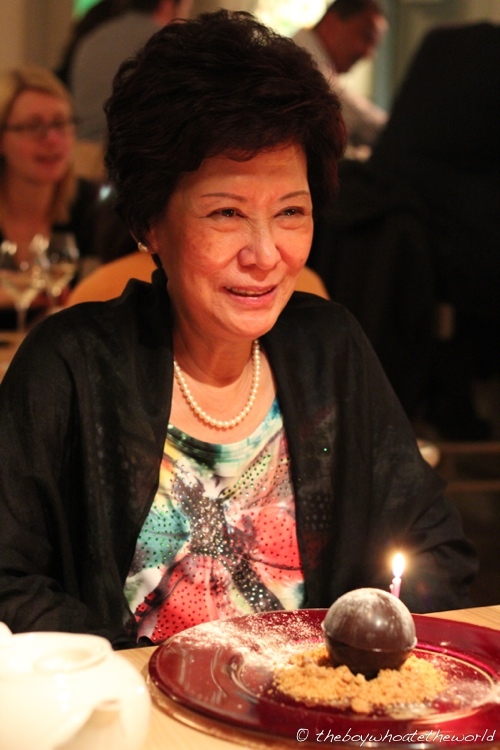 It was the mother’s birthday after all so we decided to go all out with their ‘Taste of China’ degustation menu. 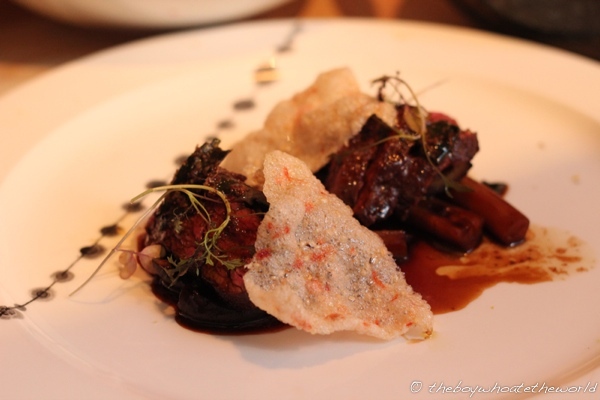 And whilst most Chinese fine dining tasting menus at the likes of Bo London and HKK would set you back upwards of £50, A.Wong’s 8-course tasting menu (priced at a rather fortuitous £38.88) actually offers pretty decent value for money considering the quality and creativity at play. We started our journey in Hong Kong with a selection of steamed Dim Sum that could rival the likes of Michelin-starred Hakkasan and Yauatcha. I’m not usually one for Dim Sum over dinner, but when Har Gaus (Prawn dumplings) are coated in effervescent citrus foam and Xiao Long Baos (Shanghainese pork and soup-filled buns) are topped with pickled tapioca pearls, serve me up this kind of Dim Sum any time, any day I say. 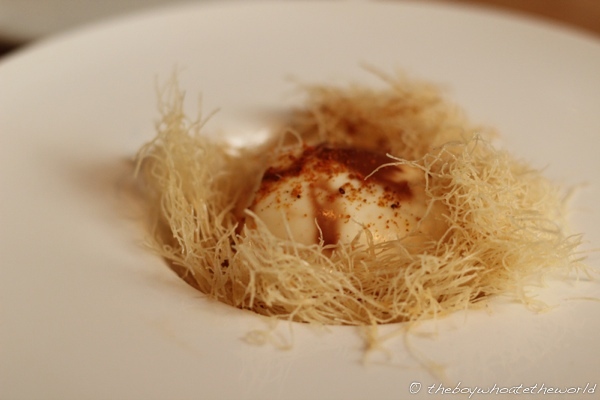 What followed next was even more intriguing: slow-cooked 65°C egg infused with tea, topped with aromatic satay spices and cradled in a crisp, air-light basket of shredded filo pastry. The contrast in flavours and textures between the smoky, oozy egg yolk and crisp filo pastry was pretty darn incredible. Who said Chinese food couldn’t go molecular? Poached Scottish razor clams, served with sea cucumber, wind-dried sausage, pickled cucumber and black vinegar was less memorable. Although the various condiments made for an interesting balance of flavours, I thought the razor clam itself wasn’t quite plump or juicy enough. When I think ‘Gong Bao’ chicken, I think of the MSG-fueled, overly spicy, greasy stuff. 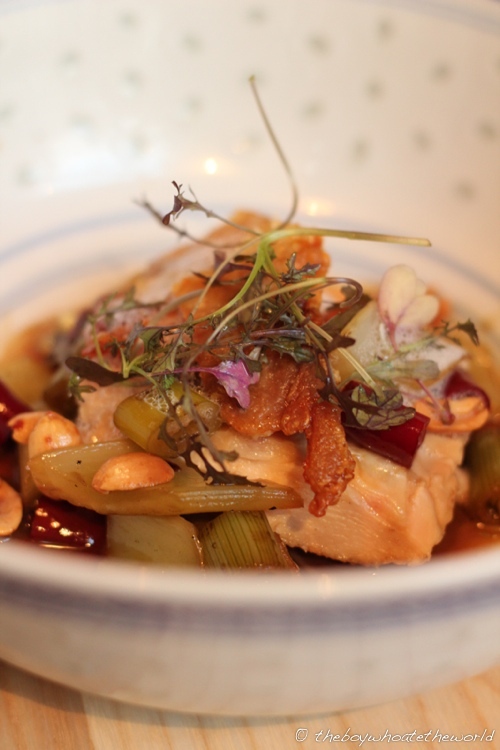 A.Wong’s version features succulent corn-fed chicken, crispy chicken skin, jumbo peanuts, micro herbs and a surprisingly light and subtle sauce infused with dried chillies. A rolls-royce of a Gong Bao chicken that’s a far cry from the traditional heart-stopping takeaway variety. 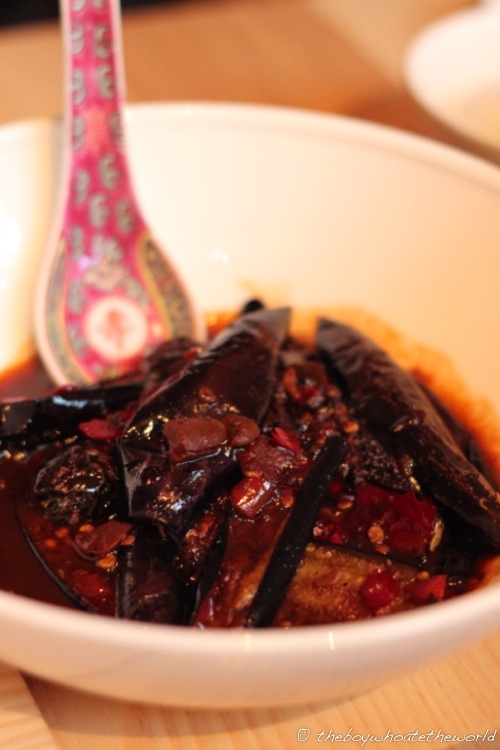 There was nothing subtle however about the Sichuan aubergine dish that was served alongside the chicken. Swimming in a thick, full-flavoured black bean sauce and drowning in red chillies, I was thankful for the generous and very necessary helping of white rice on the side to quell the heat. Onto the main event: Scottish Ribeye with shavings of Yunnan truffle. Until this meal, I never had a clue that the Chinese ate truffle, yet alone produced it in the Yunnan region. The Scotch ribeye was juicy, tender and cooked to a perfect medium-rare, complementing the earthy flavours of the truffle beautfully. 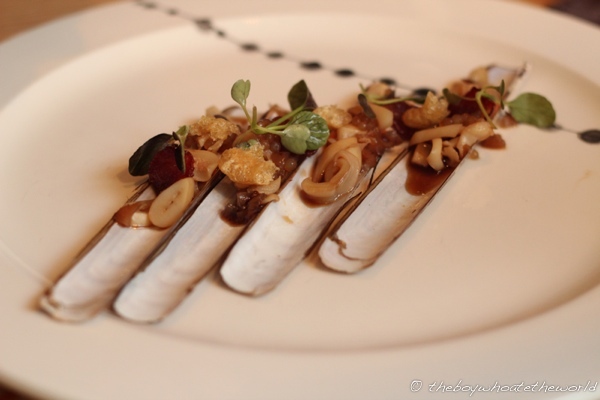 What was also a revelation was the salsify and oyster sauce combo. The delicate oystery flavours from the salsify was a match made in heaven for rich, savoury oyster sauce based demi glace. An outstanding plate of food. 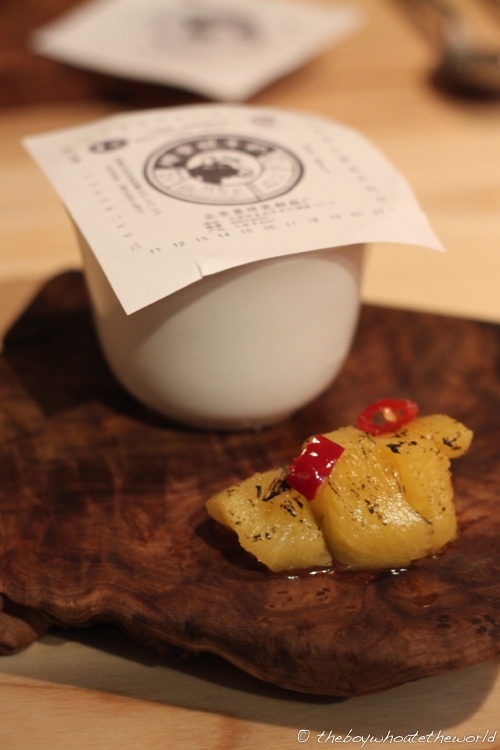 If there was one dish which constantly brought smiles round the dining room, it was their Beijing street yoghurt dessert served with chilli barbecued pineapple. The front of house team explained to us that it is common to find glass yoghurt pots sold as street snacks outside Beijing’s metro stations. To recreate the experience, all the porcelain cups of yoghurt here are topped with the same rustic paper covers sporting that vintage Chinese logo seemingly from another era. The light, slightly tangy yoghurt was delicious with the spicy, caramelised pineapple chunks. Whereas the previous dessert showed the playful side of the kitchen, the next course was a real showcase of their technical prowess. Somehow, they’ve managed to encapsulate a scoop of creamy lime sorbet with a crunchy yet air-light layer of meringue on the outside. It’s ingenious. 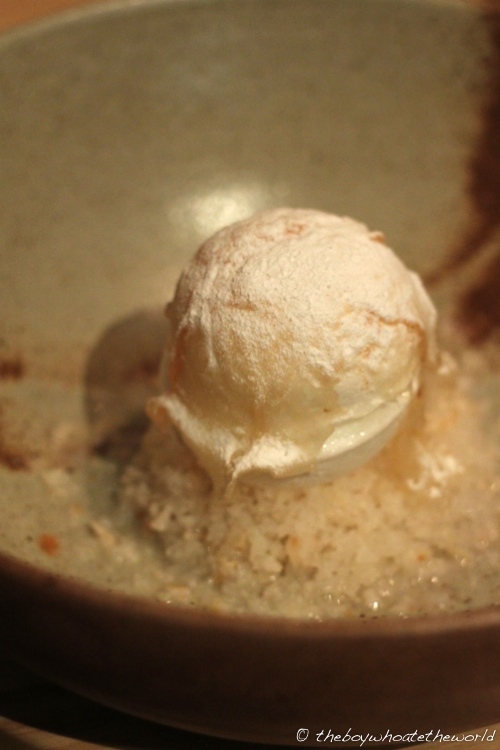 The bed of lychee granita under the ‘snowball’ was the icing on the cake, providing a soothing, palate cleansing effect to round off each mouthful. A fresh-tasting and extremely accomplished dessert that’s easily the best I’ve had all year. And it didn’t end there. It was the mother’s birthday after all. And whereas most places would simply scrawl ‘Happy Birthday’ on one of the dessert courses and stick a candle on top of it, the team at A.Wong conjured up an extra dessert course specially for her, compliments of the house. Their chocolate and caramel ball, filled with smoked banana and served on a bed of nut crumble brought the curtains down on a fantastic meal on the whole. What’s more, service from their front of house team was extremely warm and amicable throughout – a rare feat for Chinese restaurants where I often feel like I’m on the other end of a brusque, ‘all about business’ transaction. We were very well looked after by our waiter from Uzbekistan who seemed to share the chef’s ethos and passion, taking the time to walk us through the menu, story and idiosyncrasies behind each dish in full detail. Although I’ve never set foot in China before, I truly felt as if I had eaten my way there and back again over the course of the evening. Crucially, A.Wong managed to procure the most important approval of all – that from a smiling mother who was keen to amass a stack of their business cards by the end of the night. Great review! And though i’m not convinced by some of the combo’s, it sounds like somewhere definitely worth trying for that price! @Michelle: Thanks for stopping by. The more interesting combos were the highlight for me, especially the desserts! In my opinion it’s pretty good value for money given the quality and creativity on show!